Because of you, no one needs to be without a nutritious hot meal every day. Most of us believe that families should take care of each other. But sometimes families are far away from the loved ones who need them. Have you ever been ill or injured and wished someone would bring you a hot bowl of soup, or maybe a sandwich? Do you have an elderly or handicapped loved one, who is finding it difficult, or even impossible, to shop for and prepare meals for themselves? Imagine being hungry, with no one to help. 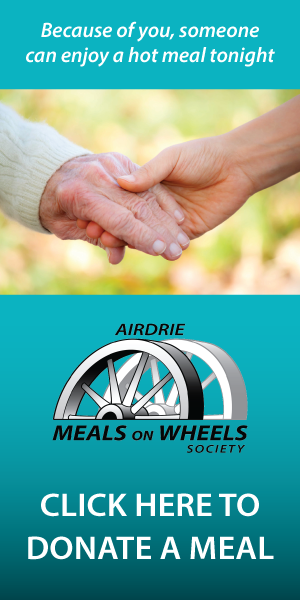 Airdrie Meals on Wheels volunteers will deliver complete meals right to your loved one’s kitchen. We subsidize the cost of meals to every Airdrie client, but depend on the support of the Airdrie community to keep costs to a minimum. By donating to Airdrie Meals on Wheels, you provide nutritious meals to those who deserve a helping hand.